Smart MOI delivers consistently long drives that split the middle of the fairway. Straight distance. That’s what you want from your driver. No need to think. Just pick a target and swing away. 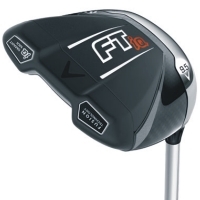 Say hello to the FT-iQ Driver, the longest, straightest driver Callaway Golf has ever created. Proprietary technology creates maximum perimeter weighting and more discretionary weight by combining a carbon composite body with the titanium face cup. This allows for precise positioning of the CG to increase stability on off-center hits and generate the straightest drives possible. The refined head shape allows the MOI, center of gravity, face height and face thickness all to perform at their peak levels, providing premium distance, unprecedented forgiveness and straighter ball flight off the tee. Strategically placed weighting in the rear corners allow standard lofts to have Draw weighting to help golfers minimize fades and slices. Tour lofts will have Neutral weighting for golfers that already have a straight ball flight and want a lower, more penetrating trajectory. Exclusive to the Callaway Golf FT-iQ Drivers, this ultra premium shaft by Mitsubishi Rayon has been designed with Modulus Differential Technology (MDT) for tour-level high launch, low spin performance.